Corrosion and Water Spot Resistant. 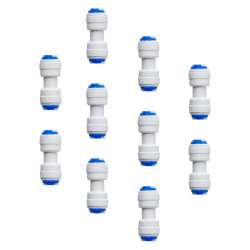 This is a faucet extender for drinking water dispensing faucet. 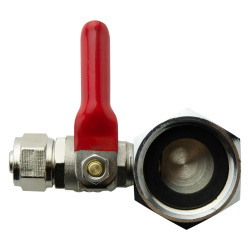 Size: Diameter 0.5" x 3.25"
The temp range is -80 to 275 F.
360 degree spout meets all your needs. 90 degree single handle provides effortless flow control. Multiple layers of environmental friendly parts ensure drinking water safety. The durable ceramic cartridge provides extreme temperature resistance, corrosion-proof , and durability for 500,000 times of use. 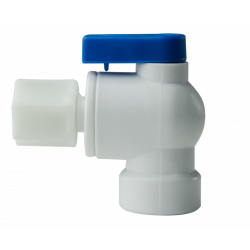 The push-in quick fitting adapters ensure super easy leak-free installation. Recent upgrades for easy installation with push-in adapter included. Modern design adds a great accent to your kitchen. 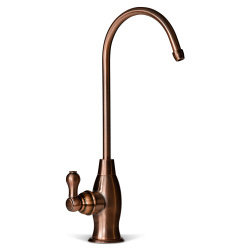 5 different stylish finishes make this faucet more elegant and special. Resists fingerprints and water spots. Easy to clean. The arc of the spout makes the range of the water flow up to 15 degrees. 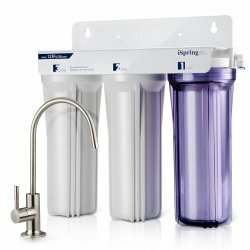 This makes it convenient for you to get the water by cups, coffee pots or cooking bowls. Every corner detail is perfectly processed, making the entire faucet look like a beautiful piece of art. Bring a sense of design to your home kitchen. No Rust, No Corrosion. The stainless steel built-in waterway tubing keeps your water clean all the way from the filter to the spout of the faucet. 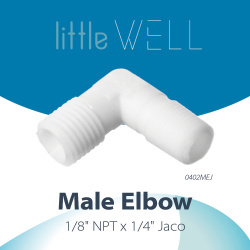 Spout height 8", Spout reach 4 1/2"
<li>Ideal upgrade for undercounter water filters and reverse osmosis systems<li>Non "air gap" faucet<li>Coke shaped high-spout faucet.360 degree free swivel<li>Antique wine; May come with Quick Fitting or Jaco Fitting<li>Backed by 3-year Manufacturer Warranty with lifetime support line 678-261-7611 from Alpharetta, GA USA. 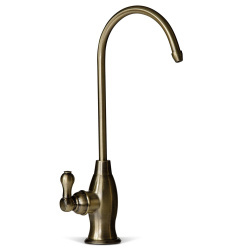 <li>Ideal upgrade for undercounter water filters and reverse osmosis systems<li>Non "air gap" faucet<li>Coke shaped high-spout faucet.360 degree free swivel<li>Antique brass; May come with Quick Fitting or Jaco Fitting<li>Backed by 3-year Manufacturer Warranty with lifetime support line 678-261-7611 from Alpharetta, GA USA. <li>Ideal upgrade for undercounter water filters and reverse osmosis systems<li>Non "air gap" faucet<li>Coke shaped high-spout faucet.360 degree free swivel<li>Oil Rubbed black; May come with Quick Fitting or Jaco Fitting<li>Backed by 3-year Manufacturer Warranty with lifetime support line 678-261-7611 from Alpharetta, GA USA. 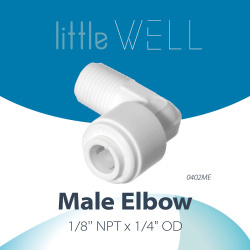 The 90-degree male elbow angle allows for tight fits on the membrane housing. 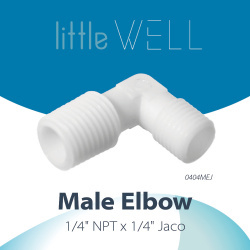 The 1/4" jaco fits standard 1/4" tubing used on most RO systems. 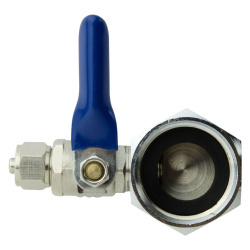 The 1/8" threaded end connects directly to most membrane housings. Push-fit connections for 1/4" tubing. 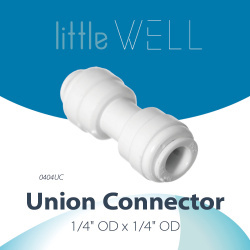 Suitable for use with 1/4" Pex, CPVC, and copper pipe. Lead free and non toxic. 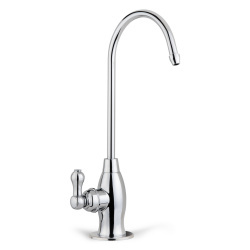 <li>Ideal upgrade for undercounter water filters and reverse osmosis systems<li>Non "air gap" faucet<li>Coke shaped high-spout faucet.360 degree free swivel<li>Bright Chrome; May come with Quick Fitting or Jaco Fitting<li>Backed by 3-year Manufacturer Warranty with lifetime support line 678-261-7611 from Alpharetta, GA USA. 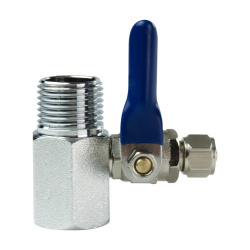 The 1/4" quick connect fitting fits standard 1/4" tubing used on most RO systems. The whole faucet body is made of food grade SUS304 stainless steel, ensuring that no Rust, no Metal precipitation into the water. The built-in plate prevents the body from shaking due to the movement of the switch, ensuring a stable long-term use of the faucet. Install the base plate with o-ring and screw on the faucet stem. Make sure your countertop has an existing hole with a diameter between 0.5 to 2.0 inches. Remove the old RO faucet if you have one. Wipe clean and dry the area. Slide the front plate onto the faucet stem, followed by the rubber washer. Insert the stem into the hole on the countertop. Under the sink, slide on the back rubber washer and tight the wing nut. (You may apply a few rounds of Teflon tape to the threads to get a better grip). Slide the push-in fitting up the push-in adapter on the base. Insert your water tubing (not provided) about 1/2 inch into the push. Connect the water and Inspect carefully for any leaks. <li>Food grade 304 stainless steel construction ensures heavy duty quality and longevity. Anti-Rust, Anti-<li>Corrosion and Water Spot Resistant. 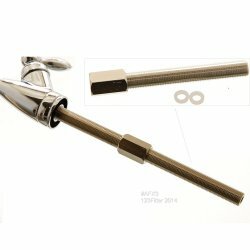 <li>360 degree swivel spout with 90 degree single lever handle offer easy water control. 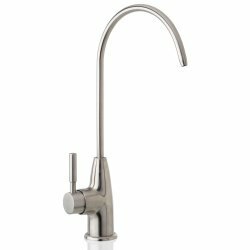 9.5" high-rise spout provides enough space for a variety of sink activities in kitchen. 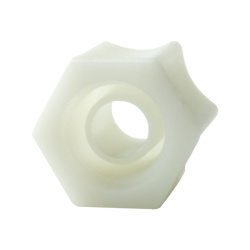 <li>Fits 0.5 inch to1.5 inches kitchen sink hole and connects 1/4'' tubing. <li>Non air gap RO faucet. Cold water supply only.